Warning: This is a really long video. Near the end I started making a few mistakes but honestly it’s pretty difficult to talk for a half hour straight! It is for me anyway. This video was made due to the fact that I took on a cabinet build job for a relative of mine. She is moving into a new-to-her home and is fixing it up. One of the places for improvement is in both bathrooms. I’ve got a lot of work still to do for her but the first stage was to build two bathroom vanities. One 75″ long and the other to be 25″ long. The process is the same for both vanities so I just decided to show you the larger of the two. 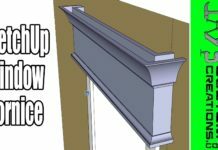 Hopefully you will be able to pick up a little SketchUp knowledge as well as a brief, virtual overview as to how I construct cabinets. Enjoy! Jay, great video. I understand that there is all kinds of analytics about how long a video is supposed to be but SketchUp is allowed to go longer. Once again, I have learned more than in this 30 min. than hour of hacking and slashing. If nothing else to use this video as a reference. Jay, great job, good tutorial. Amazing tutorial, I have been 3D modeling professionally for 10 years with Maya but started trying Sketch up as a few of you woodworkers use it on youtube. I watched all the video and i will likely watch it a few more times as i copy and learn from your work flow. i would say dont worry about how long it is as it was worth even more time than it is. Some peeps may simply fast forward if they wish but others like me could only learn as much as i just did with an in-depth video so thank you. Again an amazing tutorial.. Thanks for the feedback Steve. I appreciate it. Jay, hate to bug you but when you start the very first rectangle “R for rectangle” you start at the origin X, Y, Z axes and “let’s draw this up”. What are you doing “off camera” (keyboard, whatever) that forces Sketchup to infer that the rectangle is to be on the blue and green axes? I’m not doing anything off camera. I position the model so that whatever plane I want is closest to parallel with the computer screen. Hope that makes sense. Thanks. I tried your suggestion, i.e, orbited around to put the plane — green blue in this case more oriented to the computer screen, and lo and behold it works. Thanks. Jay, Thank you for this video, and the length was not an issue. 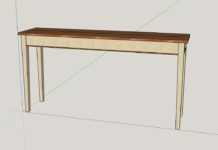 I have Google SketchUp, but don’t really know how to use it. I see plans all of the time by Ana White, and I know that she uses this program as well (I believe). To see the cabinet from start to finish was very helpful in the work flow, because I have not had any training on it, but when messing around on it, I couldn’t figure out how to get pieces to line up correctly, fill in the space completely and how to do the push/pull – or the copy (to get to update multiple pieces) or to change just the width/length of pieces you were working with. I’ll be watching this again just to get the key strokes you mention down again, and hopefully my next attempt in SketchUp will be a bit more successful. Thanks for the feedback. Unfortunately the shorter, direct, to the point the video is the better it performs on YouTube. Thanks for watching though! Yes, the SketchUp videos are a lot easier to produce. I’ll keep making them. I used to think I was reasonably proficient at SketchUp until I watched this video. So many tips and tricks in a real-world example. Fantastic. Thanks Nicholas. I appreciate the feedback. Just ran across this one, excellent Jay! And…crap, now I’ll have to try my hand at doing some cabinets. I hate you. :-). It seems every time I watch one of your videos I add another “must build” project to my long list. Congrats on another excellent post. 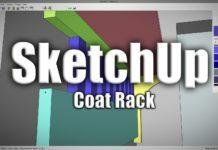 Dude, awesome video and personally, i wouldn’t have cared if it was an hour video, you gave some great tips while working with sketchup. Thanks again.